The view from Crocker Lane: Where home lots and woodland meet. Neighbors of a planned addition to Benton County’s North Albany Park were concerned when they saw loggers had felled some big trees they thought would be preserved. But cutting down 190 mature trees — while preserving more than 500 others — was part of the approved subdivision plan without which the natural area might not be saved at all. For the background, you can check my Sept. 2, 2015, update on Myles Breadner’s subdivision plans and land donation of part of this wooded area at the corner of Crocker Lane and Valley View Drive (https://hh-today.com/a-peace-of-nature-will-be-saved/). I checked with Jeff Powers, director of the Benton County parks and natural areas. He explained that Benton County had not yet taken possession of the land which it has an option to acquire for $1. It will do so when the subdivision platting process is complete. 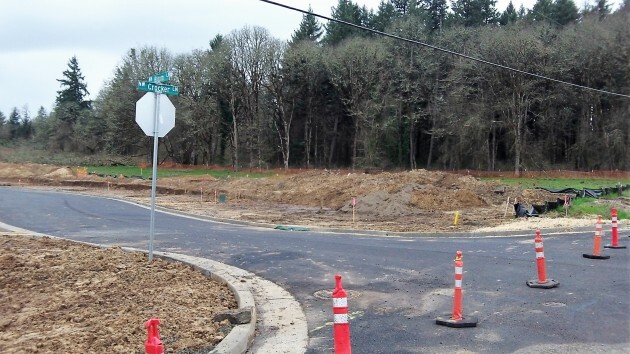 In an email, Powers wrote, “I am aware of the neighbor’s concerns regarding the trees which were cut down, but the trees removed are located on approved subdivision lots (predominantly lots 48-56) located in the northwest corner of the parcel. These lots happen to be immediately adjacent to existing residences along the entry street into North Albany Park. I have doubled back with city officials and they confirm that the subdivision size and configuration have not changed from what the city approved in April/May of 2015. When the county does take ownership of the remaining wooded parcel, Powers says, it will get the public involved in discussions about the management of the property. The Albany Planning Commission approved a preliminary layout of the Albany Heights II subdivision on April 27, 2015. The plan called for 82 lots and streets covering 17 acres. The remaining 15 acres of the 32-acre site would be open space, and that includes the park donation containing 536 trees, according to material before the planning commission last spring. Great job giving us the details of the development. I had assumed that the park would be taking the whole parcel. And, I also assumed that when we saw a lot of large recently felled trees that the deal with the Benton County parks had fallen through. Thanks Hasso. Great to have you on the beat.